Rolling element bearings are standard components in most pumps. Of the many factors that affect their long-term performance and reliability, contamination in the bearing lubricating oil plays a major role. Contamination and oil degradation over a short period of time can be particularly worrisome. Repeated short-term contamination implies that the lubricating properties of the oil will be impaired and bearing reliability will be diminished. Sulzer Pumps, a global pump manufacturer specializing in centrifugal pumps and agitators/mixers for various industries, analyzed some of its models of standard centrifugal pumps where short-term oil degradation had been reported. Many of the field reports indicated that “black oil” was present, predominantly in the thrust bearing assembly. These reports often stated that small amounts of bronze had been detected in the oil. To determine the causes of the short-term contamination and black oil, a full investigation that included numerous controlled tests was conducted. The test results were reviewed, recommendations were made and modifications to the pumps were carried out accordingly. Field tests were then conducted to determine the success of those modifications. Standardized ball bearing assemblies are a feature in most pumps manufactured by Sulzer Pumps. Some of the company’s pumps contain a matched 40-degree contact angle ball bearing arrangement used as a thrust and radial bearing, and a single deep-grooved ball bearing used as a radial bearing Both bearing arrangements use ring oil-lubrication with bronze oil rings submerged into the bearing oil sump. Other bearing arrangements are present in single-stage overhung pumps, which use matched 40-degree contact angle ball bearings for the thrust and radial bearing, and either a deep groove ball bearing or a cylindrical roller bearing for the radial bearing (Figure 2). The bearings are mounted in a common housing and use ring oil-lubrication with bronze oil rings submerged into the bearing oil sump. Within a period of only a few months, a number of field reports of black oil formation were reported. This phenomenon of black oil is defined as the process by which the lubricating oil darkens or turns black within a time period ranging from one hour to several weeks. In the case of the overhung process pump, there were reports of both black oil formation and significant amounts of bronze found in the bearing oil. Analysis of oil samples taken from the field showed high concentrations of particles 3µm to 5µm resulting in a range of oil colors from dark brown to black. However, no single cause of the degradation could be isolated from the field report data. To determine the causes of the phenomenon, a full investigation was performed. To help identify all possible issues that could contribute to the phenomenon, several groups within the company carried out reviews. All issues identified were then reassessed and compiled to form a problem matrix (Figure 4). Wear-related issues. Issues related to wear mechanisms. A combination of several issues was believed to have been contributing to the black oil formation. By using the matrix as a guide to the investigation, however, it was thought that many of the possible causes could be eliminated early, allowing resources to be focused more on the real issues. The issues listed in the matrix were therefore examined in detail to determine their significance. Some issues were reviewed using data gathered from the field, such as oil samples and replaced bearings. Other issues had to be evaluated using in-house testing. Because it is possible for oil to react with other chemicals present in the bearing housing, chemistry-related causes for black oil formation were considered. Known examples of this phenomenon include reactions between some oil additive packages and the rolling element bearing. Therefore, the tests were designed to identify if there were any such reactions occurring within the bearing housing assembly. Three issues were identified in the matrix as being possible contributors to the black oil. They were reaction of the oil with the preservative (corrosion inhibitor) used inside the bearing housing, reaction of the oil with the sealing paint used inside the bearing housing, and changes in the lubricating oil and additives. Test results in all three areas showed no correlation between these issues and black oil. Cleanliness of the lubricating oil is of great concern. If the oil or the system into which it is placed is contaminated, the contamination will be circulated through the rolling element bearings. These bearings are easily damaged by particles passing through them or by corrosion caused from water in the oil. Two issues identified in the matrix as being possible contributors to black oil were housing cleanliness after manufacture and contamination during operation. It was concluded that neither of these issues contributed to the oil blackening or the bronze in the oil. Five wear-related issues were identified in the matrix as being possible contributors to black oil. These were oil ring stability and immersion depth, bearing fit, bearing type, low oil delivery to the bearings, and oil viscosity and additives. To determine the significance of each of these issues, an in-house test program was established. The test program consisted of 13, two-hour and seven, eight-hour tests and was carried out on a custom designed test rig. The rig was able to apply radial and axial loads to an assembly duplicating the configuration of the between bearing pump (Figure 5). Plexiglas viewing windows mounted into the bearing housing and temperature probes allowed personnel to observe the complete behavior of the bearings being studied. Prior to each group of tests, the test rig was disassembled and new angular contact thrust bearings were fitted to the bearing housing. Clean ISO VG32 turbine oil was used for each test. After each test, within seconds of stopping, a sample of oil was taken from the radial and thrust bearing. The test rig was then disassembled and the bearings removed for inspection. At this time, the bearing housings were cleaned to remove all traces of oil and contamination. 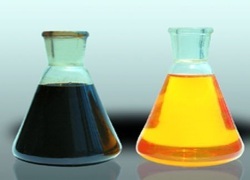 Oil degradation was determined by color change, although some conventional oil analysis was used for comparison. It was found that oil color was an accurate indicator of the level of 3µm to 5µm particles within the oil. Magnetic separation and filtration of the oil sample also easily determined the quantities of ferrous and nonferrous metallic particles in the oil. The parameters identified in the matrix as being contributors to black oil were evaluated to determine their significance. A pendulum motion pivoting about top dead center of the ring (where it contacts the shaft), swinging in a plane at 90 degrees to the shaft axis (Figure 6, upper). Tracking of the ring backward and forward across the oil ring carrier (Figure 6, lower). Tests showed that the bronze in the oil was primarily due to the oil ring erratically hitting the bearing housing and bearing cap or wearing against the oil ring carrier. Varying the oil level did not eliminate this behavior. As the oil level varied, the oil ring motion became erratic at a different oil temperature. It was not possible to set an oil level that would have removed this behavior completely. The behavior was also sensitive to small changes in oil viscosity. During the tests, alternative metallic oil ring materials - mild steel and Nitronic 60 - were tried in an attempt to prevent the deposits of bronze material in the oil. The results showed that the bronze particles in the oil were substituted by mild steel or Nitronic particles. Following this unsuccessful testing with metallic oil rings, a nonmetallic oil ring was selected. The nonmetallic ring ran in a more stable fashion eliminating the erratic tracking and pendulum behavior seen with the metallic rings, and it did not exhibit any wear during testing. The tests showed that oil viscosity exerts a greater damping influence over the low mass, nonmetallic ring than a metallic ring, thereby effectively preventing the erratic motion and tracking. It was concluded that the bronze particles in the oil contributed to the black oil formation. Circulation of large metallic particles through a rolling element bearing would result in undesirable metal-to-metal contact with removal of the rolling element bearing material and oil degradation being a consequence. When the matched angular contact thrust bearings were originally installed, a between-bearing shim was included in the standard design. This 0.002-inch thick shim was fitted between the inner races of the angular contact thrust bearings to increase the internal clearance, resulting in a lower operating temperature. Tests showed that the inclusion of the inter-bearing shim caused high levels of bearing skidding (of the unloaded bearing), and black oil. For the remaining tests, the inter-bearing shim was removed and tests were conducted using medium clearance angular and medium preload angular contact bearings. This was done to evaluate the effect of decreasing the bearing internal clearance and its effect on black oil formation. Level of bearing preload. Tests showed that a higher level of bearing preload resulted in less black oil formation. It is believed that this is due to preloaded bearings having a lower probability of skidding. The disadvantage to using preloaded bearings is that they have the tendency to run hotter than comparable clearance bearings. Bearing assembly techniques. Two of the conducted bearing tests used improved assembly techniques. With this process, great care was taken to ensure that the correct internal clearance within the matched angular contact bearings was achieved. The tests showed that good results could be obtained by using correctly assembled medium clearance angular contact bearings. The conclusion was that the internal clearance of the matched angular contact bearings is critical to their correct operation. As long as the bearing’s internal clearance is held at the design value, the bearing can be made to operate with minimum skidding and black oil formation. Initial reports from the field suggested that the problem of black oil was more severe in the pumps’ thrust bearings than in the radial bearings. Some sites reported that black oil occurred only in the thrust bearing. To investigate these reports, separate oil samples from the DE (radial) and NDE (thrust) bearings were taken during testing. The initial tests on the bearing test rig found that the oil samples from the DE bearing with the deep grooved ball were considerably better than the samples from the NDE bearing with the matched angular contact bearings. It was discovered that the matched bearings were much more susceptible to this form of oil degradation/contamination, due to the geometric and functional factors inherent in a paired bearing design. These factors were: less control over bearing internal clearance; thrust loading that created unloaded conditions for one of the bearings, causing ball skidding; and higher oil operating temperatures reducing the oil viscosity and oil film thickness at the point of ball contact. While the matched bearings were a factor in black oil formation, it was not possible to alter the basic bearing type due to customers’ expectations and API 610 requirements. Instead, other bearing parameters such as bearing fit were optimized to compensate for the design limitations of this type of bearing. The oil delivery (flow rate) to the bearings was observed through Plexiglas windows mounted in the side and end of the bearing housing. From the test observations, the hypothesis was that oil delivery was sufficient to ensure adequate lubrication. To verify this hypothesis, an additional oil feed gallery was added to increase oil delivery. Tests were conducted using this arrangement and when the results were compared with previous tests, there was no improvement in these oil samples’ color. The only observation was that increased oil delivery resulted in increased bearing temperature due to more oil churning within the bearings. It was therefore concluded that oil delivery was not a contributing factor to black oil formation. The actual oil requirements for lubrication of a rolling element bearing are only a few drops per minute. Additional oil only serves to help remove the heat generated by the bearing. Because oil viscosity affects the oil film thickness at the ball/raceway/cage interface, oil viscosity was identified as a factor important in black oil formation. Therefore, a test to determine the significance of an increase in oil film thickness on black oil formation was conducted. Under ball skidding and other less-than-ideal conditions, the oil film acts as a barrier separating the components from metal-to-metal contact. Thus, generally speaking, the thicker the oil film, the better its separation potential. It was concluded that higher viscosity oil reduces discoloration. Oil additives were evaluated to determine whether antiwear additives had any effect on the level of black oil. In addition to the standard VG32 viscosity turbine oil used by Sulzer Pumps for many years, testing was performed using VG46 and VG68 turbine oils (from the same manufacturer) and antiwear VG32, VG46 and VG68 oil. The antiwear VG32 and VG46 oils were found to give similar results to a standard turbine VG32 and VG46 oils. The conclusion was that antiwear additives alone do not reduce the level of blackening. Nonmetallic oil ring, VG46 oil and a medium preloaded bearing. Nonmetallic oil ring, VG46 oil and a medium-clearance bearing (with controlled assembly). The bearing arrangement with the worst wear levels and the most oil discoloration on tests was the bronze oil ring, VG32 oil, medium-clearance bearing and an inter-bearing shim. The primary source of bronze debris in the oil was due to the oil ring wearing against the bearing housing and oil ring carrier. A nonmetallic ring successfully eliminated this wear. The viscosity of the oil affects the level of discoloration of the oil. Higher viscosity oil reduces the discoloration, but it does not eliminate it if the other design problems are not addressed. The use of antiwear oils alone does not prevent the discoloration of the oil. Varying the amount of oil delivery to the bearing did not affect the discoloration of the oil. Oil delivery rate, beyond that required for good lubrication, is not a factor in black oil formation. The use of thrust bearings without an inter-bearing shim will reduce the blackening of the oil by eliminating ball skidding within the bearing. The use of preloaded thrust bearings reduces the probability of ball skidding, which is a factor in black oil formation. This type of bearing will have a tendency to run hotter (comparative tests show a 0°F to 10°F increase in sump oil temperature compared to non-preloaded bearings). Clearance thrust bearings give comparable oil color to preloaded bearings provided nonmetallic oil rings, VG46 oil and controlled assembly techniques are used. In the cases studied, black oil formation was not caused directly by cleanliness- or chemistry-related issues. Bronze oil rings were replaced with nonmetallic oil rings. The standard viscosity of the oil used in the bearings was changed from VG32 to VG46. Bearing temperature alarm/trip settings were raised by approximately 5°F to allow for a slightly higher operating temperature (due to the higher viscosity oil). Medium clearance thrust bearings without an inter-bearing shim became the standard thrust bearing choice. Assembly procedures and the installation and operating manuals for the pumps were revised to reflect the best practice identified during the tests.